Next expo is at the Greater Philadelphia Expo Center. ARE SOLD OUT FOR APRIL! Registration fee for tables/spaces is $75 each with two free admissions. A month prior to the show tables will be $85 each. At the door tables will be $95 each with one free admission. Tables/Spaces will be approximately 30” x 8'. Vendor setup is on Saturday from 6:00 a.m. to 9:00 a.m. After 9:00 a.m. on Saturday everyone including late vendors must use the general public entrance. All other doors will be secured throughout the show. 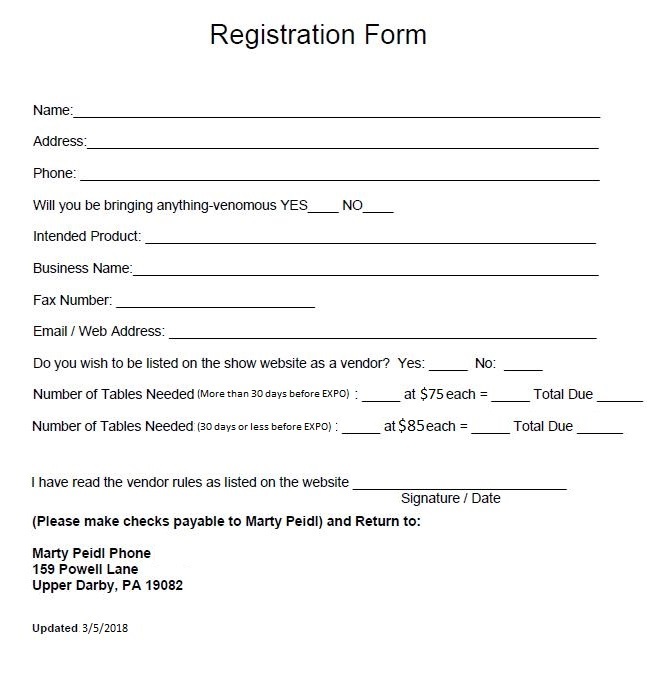 Reserved tables will be held until 9:00 a.m. After that time they will become available to any other vendor that wishes to rent them at the regular fee. No refunds will be given for reserved tables if the vendor fails to show up. Two free admissions will be included with the first table and one for each additional table. All vendors will be required to sign a liability waiver on the day of the show taking full responsibility for everything they bring and sell at the show. All vendors/attendees are expected to act in a professional manner. Angry outbursts, verbal threats or physical violence will not be tolerated and violators will be asked to leave. All animals must be healthy and acclimated. Any animal deemed questionable or ailing by staff or show veterinarian must be removed. All animals must be in clean, suitable, secure and humane containers. No endangered, protected, or native Pennsylvania species allowed. PA Fish and Wildlife are usually at the show. It is your responsibility to know the legality of what you intend to bring. The Commonwealth of Pennsylvania Department of Agriculture requires all reptile and amphibian dealers and propagators (breeders) to be licensed through them. For more details follow the links in the State Rules section. When you sell a venomous animal you must tell your customer that they will have to exit the show and they may not wander around the show with a venomous animal. You can hold the animal for them until they are ready to leave the show. The venomous section will be limited to an assigned area that is why I MUST know if you intend on bringing venomous animals. These rules are intended for the protection of you as the vendor, the buyer, the general public and the show. These rules are not flexible and will be enforced. Please help us to continue to allow venomous animals by following these few simple but necessary rules.